Many-to-Many: Which Dimension is Used? In SSAS, it is possible for a M2M to have 2 paths. The first one is through Dim1 and second one is through Dim2. In this case, which path will be used by M2M? I’ve come across this question about 2 years ago, and have been delaying finding the answer until now. So here it is. Ah before I start, 2 things. 1) This post is related this post I wrote 2 days ago: Many to Many Is Not Always Right. 2) Thank you to Robert [last name] for bringing this up. I came across it for the first time 2 years ago, and I’ve always wanted to find out. As always, it is easier to explain (and learn) by example. On the top we have Fact Account Balances which list how much money is in each account. The second fact table (Fact Customer Account) links each customer to the Fact Account Balances in two ways: via Dim_Account and Dim_Account2. For example, these 2 account dims could be Mortgage Account dimension and Saving Account dimension. If we create a cube with M2M like this, which dim will M2M use, Dim Account or Dim Account2? The answer is: both, it depends on the data. As you can see above, 3 customers, 3 accounts with balance = £20, £30, £40. Customer1 owns account1, customer2 owns account2, customer3 owns account3. Ideal situation. On the second path, both customer 1 and 3 owns account 1. What does it mean? It means that only the rows where account1 = account2 are shown. SSAS only shows the rows when both paths are the same. It does not show the rows where the paths are different. 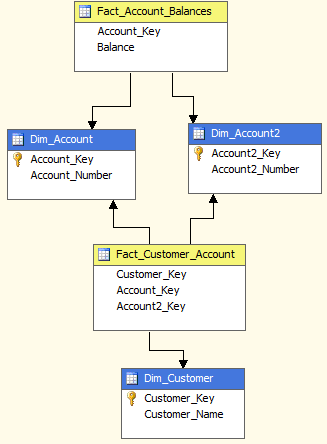 So my conclusion is: if M2M to have 2 paths, SSAS only shows the rows when both paths are the same. As always, I welcome comments and questions on vrainardi@gmail.com. Yes, SSAS does the m2m join based upon all common intermediate dimensions. So it’s not that there are two paths… SSAS just uses one path that combines both common dimensions. The question is: why? Is there any explanation for this design? 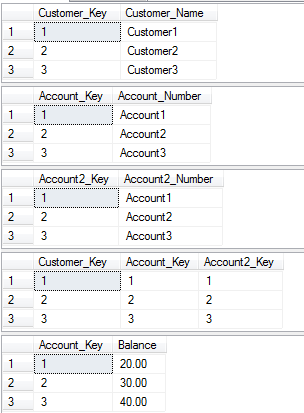 If you removed Dim_Customer and Fact_Customer_Account from the schema, you would still have the same issue, since your 2 Account dimensions are related to the main fact table through the same key. This puts 2 constraints on the fact table and you can only get facts when both accounts are the same. Further filtering of the fact table with the information contained in the bridge table will not arrange this.